Peony has been used since ancient times for its appealing scent, beautiful blooms, and medicinal benefits. Find out more about its myriad of uses. Peony has one of the longest histories of any flowering herb, and has been used since ancient times both as an ornamental and medicinal plant. Traditionally, it has been used to manage arthritis, help depression, treat asthma, and more. Promoting liver health. Peony root has hepatoprotective effects, which can lower bilirubin levels, and it is often used to promote liver health and treating viral hepatitis. Reducing pain and inflammation. 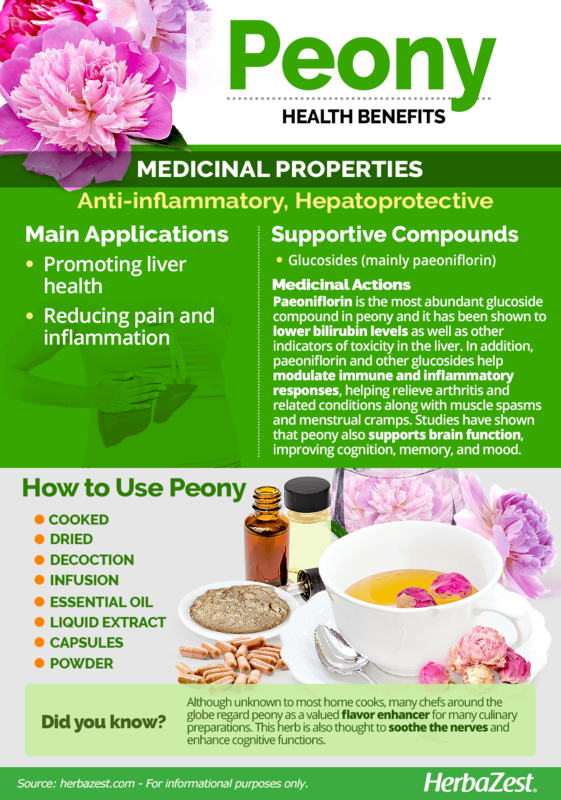 Peony's anti-inflamatory, immunostimulant properties have proven effective for treating rheumatoid arthritis and other related conditions, as well as for relieving muscle spasms and menstrual cramps. Relieving symptoms of depression. 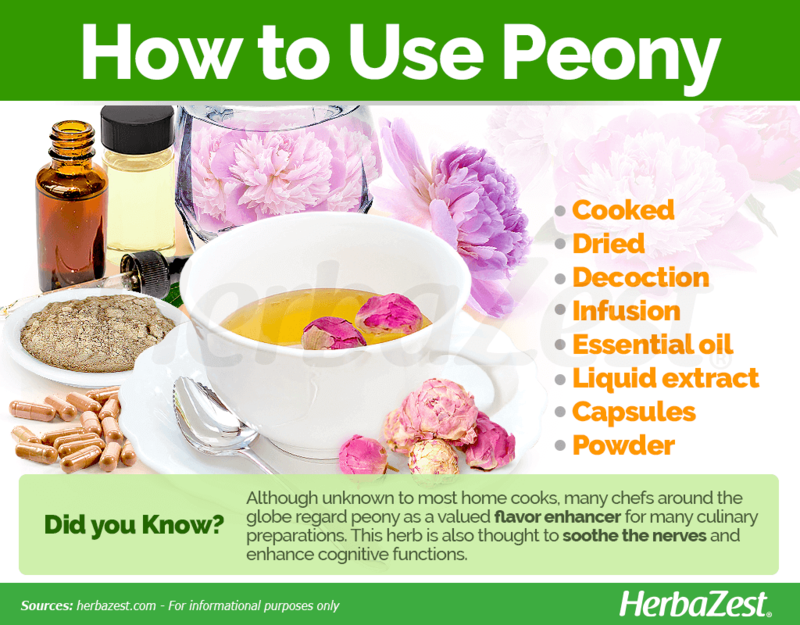 Studies have shown peony's ability to support brain function, improving cognition, memory, and mood. Treating asthma. Peony properties include antispasmodic actions, which can calm cough and asthma attacks by relaxing the airways, thus improving breathing. A decoction of peony's root has been used for centuries in Traditional Chinese Medicine (TCM) for the treatment of rheumatoid arthritis, systemic lupus erythematosus, hepatitis, dysmenorrhea, muscle cramping, spasms, and even fever. 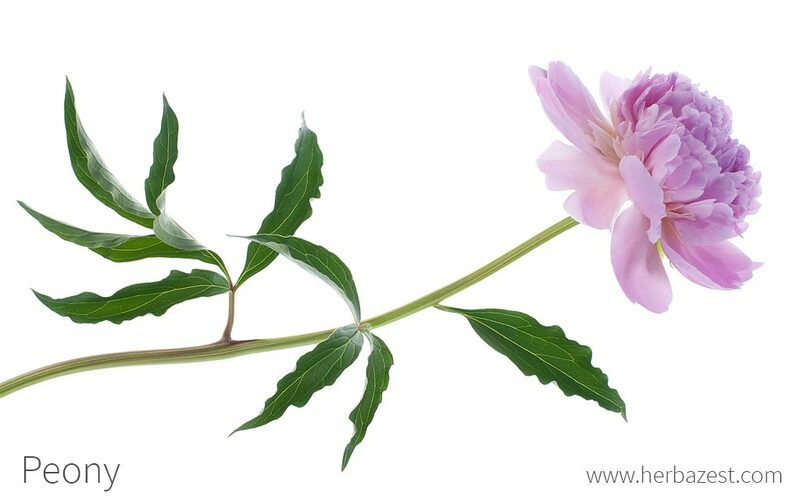 All peony species contain high amounts of anti-inflammatory glucosides, but paeoniflorin is the most abundant one, and it is largely responsible for peony's medicinal actions, though other compounds likely play a role as well. 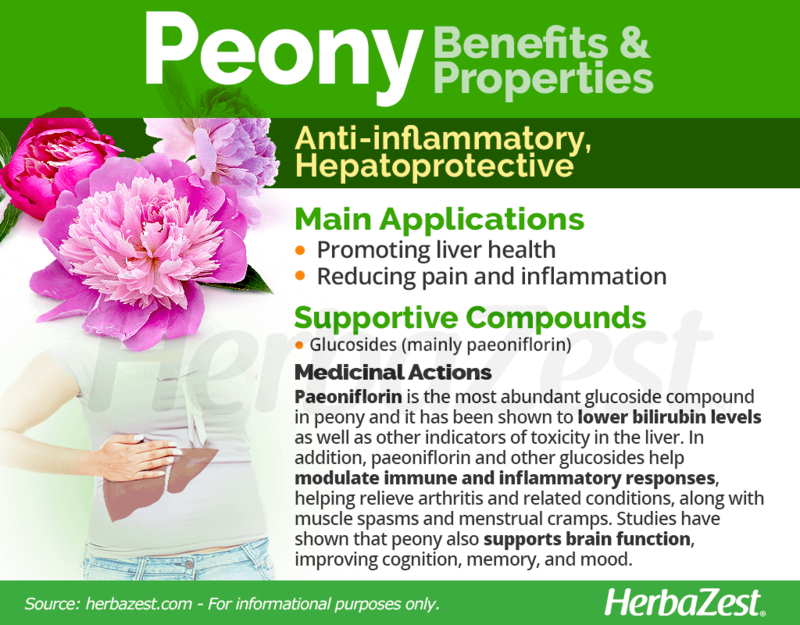 The hepatoprotective effects of peony's root are related to its ability to lower bilirubin levels and other indicators of toxicity in the liver. In addition, paeoniflorin and other glucosides help reduce the amount of cytokines, which are small proteins that modulate immune and inflammatory responses, and have been shown to relieve arthritis and related conditions. Furthermore, peony properties notably include neuroprotective and mildly sedative effects, which have been shown to benefit brain function, improving cognition and mood disorders, such as depression and anxiety. Though the exact mechanism of these medicinal actions is yet to be fully explained, it is thought that peony's glucosides inhibit monoamine oxidase (MAO) - an enzyme that inactivates certain neurotransmitters - also reducing oxidative stress, which might even prevent the onset of Alzheimer's disease and dementia. PEONY HAS BEEN SHOWN TO ENHANCE BRAIN FUNCTION, INCLUDING MEMORY, COGNITION AND MOOD. Other herbs with hepatoprotective benefits are milk thistle and boldo, whereas turmeric and devil's claw are well-known for their anti-inflammatory effects. Peony has been traditionally used in Traditional Chinese Medicine as a coagulant agent, for treating painful menstruation (dysmenorrhea), bleeding wounds, and nose bleeding. However, this medicinal property may be counter productive for people taking anticoagulant drugs or women that experience amenorrhea, which is characterized by irregular or absent menstrual periods. Although peony has been found to be generally safe for the liver, it is important to consult a physician or psychiatrist before taking it for depression. Cooked. Although the culinary uses of the peony are less known, due to its pleasant sweetness, the herb is used as a flavoring, in China and elsewhere in the world. Dried. The dried roots of peony can be added to many dishes, as well as made into medicinal preparations. Powder. Peony powder can be used for culinary purposes, due to its sweetness, and also be consumed for its hepatoprotective, relaxing, and anti-inflammatory properties. Decoction. Peony properties have been used in this form for centuries in Tradicional Chinese Medicine (TCM) for treating liver diseases, joint pain, asthma, and many other health conditions. Infusion. In this popular form, peony can help soothing the nerves and enhancing mood, as well as relieving arthritic pain and menstrual cramps. Essential oil. Extracted from the peony flower, this essential oil is popularly used in aromatherapy to soothe the nerves. Its topical application is thought to promote skin health, as well as calming muscle spams. Liquid extract. Obtained from the distillation of peony's root, this medicinal preparation is used, previously diluted in water, for treating hepatitis and other liver ailments, as well as for relieving arthritis and enhancing cognitive functions. Capsules. This is a very popular form of reaping peony benefits, since it comes in standardized daily doses for a complementary treatment of joint pain, as well as for liver support and nerve function. Different types of peonies are available year round in local nurseries and garden's supply stores. Although peony's root and dried leaves are not usually available from local supermarkets, they can be ordered online, in bulk or in practical teabags. Peony essential oil and liquid extract, as well as capsules and tablets are mainly found in natural health stores and online retailers. The concentration of medicinal compounds may vary depending on the brand, so it is important to read the labels and choose only certified products. THERE IS A WIDE VARIETY OF PEONY SUPPLEMENT CHOICES AVAILABLE THROUGH ONLINE RETAILERS. The peony bush can be difficult to grow successfully. However, with dedication and basic care, it can be a beautiful addition to any home garden. Peonies prefer at least eight hours of full sun daily. While they can tolerate partial shade, blooming time can be effected by the lack of direct sunlight. A fertile, well-drained soil is ideal for peonies to thrive. Wet, heavy, poorly-drained, sandy, or clay soils must be avoided. To not overcrowd the bushes, it is important to plant peony bulbs at least two feet (60 cm) apart. Peony bulbs should be planted in the fall (late September and October) no more than two inches (5 cm) below the soil. Peonies do not like root competition, so they must be planted at least 12 inches (30 cm) away from other herbs, and far away from other trees and shrubs. Fertilizers must be applied to peony bush with adequate dosages of potassium and phosphorus, and there should be no excess of nitrogen. Care must be taken not to apply the fertilizer directly, which would burn the peony plant. During the first year, it is critical to provide enough water, always taking care of not soaking the soil. Once established, peonies require very little watering, although mature bushes can benefit from deep watering during dry spells. Care should be taken to prevent diseases and pests, since peonies are prone to bacterial blight, botrytis blight, phytophthora blight, Southern blight, galls, leaf blotch, nematodes, powdery mildew, root root, verticillium wilt, viruses, and white mold. Peonies are native to southern Europe, western North America, and Asia, and all species are distinguishable by their deeply-lobed leaves and fragrant flowers, with satin, ruffled petals, which can be simple (with a single line of petals), semi-double (five or more outer guard petals with a center of smaller inner petals); or double (Five or more outer guard petals with a center of stamens and carpels that for a full body blossom), along with different combinations of the above. The height of a peony plant depends on the type. Herbaceous peonies grow to a height of two to four feet (61-122 cm), whereas woody tree peonies can reach four to six feet (122-183 cm). Peony, or Paeonia officinalis, is a member of the Paeoniaceae family, which includes about 40 species of flowering plants. The only genus in this family is Paeonia. Over the last 4,000 years, many different varieties and subspecies of the peony family have been cultivated throughout the world. However, only a few of these subspecies are produced commercially because many are difficult to cultivate. Paeonia officinalis is divided into five subspecies: banatica, huthii, italica, microcarpa, and officinalis. There are four types of peonies that are generally grown in gardens; the woodland peony (Paeonia japonica), the woody tree peony (Paeonia suffruticosa), the garden or herbaceous peony (Paeonia officinalis hybrids), and the intersectional peony (also known as the Itoh, a hybrid of the garden and tree peonies). The development of different cultivars has broadened the scope of peony blossom colors, which can range from crimson to white. Examples include the magenta 'Rubra Plena' and the white 'Alba Plena' with pink tinges. Researchers believe peony was first cultivated over 4,000 years ago in China where, to date, it is considered an important medicinal herb. Peony is mentioned several times throughout ancient Greek and Roman medical treatises, as well as during the Middle Ages. It was during this period that peony was introduced to the Alps by Benedictine monks, and from there it found its way into the gardens of northern Europe. Because of its cultural, ornamental, and medicinal importance, in 1903 peony was declared by the Qing Dynasty as China's national flower, although in 1923 the title was transferred to the plum blossom. Due to its beauty and vibrant colors, the peony flower is considered as a symbol of happiness, good fortune and prosperity in the Chinese culture. In Europe, during medieval times, peony became popular enough to be integrated as a part of Christian symbolism, representing wealth, feminine beauty, and healing power. The peony is named after Paeon, a student of Asclepius, the Greek god of medicine and healing. According to mythology, Paeon was instructed by Leto,the goddess of fertility, to obtain a magical root growing on Mount Olympus that would soothe the pain of women in childbirth. Asclepius became jealous when Paeon was successful, and threatened to kill him. Zeus saved Paeon by turning him into the peony flower. Though peony has been historically grown for its medicinal value, it currently enjoys great popularity due to its ornamental beauty. Various types of peony are grown commercially in Europe, Asia and North America, being China and Japan are the biggest producers. In Alaska, peonies are successfully cultivated because their growing season begins in late summer. Only in 2012, the largest and least populated state in the United States planted 101,000 roots, and over 25,000 were sold. Ornamental. Peony's main use is as an ornamental flower. Blooms can be used to form a bouquet at weddings, and are sometimes worn as a hair accessory. Cosmetics. Peony is widely used in the cosmetics and beauty industry, where it is usually added to bathroom products such as shampoos and shower gels for cleansing and moisturizing the skin. Germplasm Resources Information, Taxon: Paeonia officinalis L.